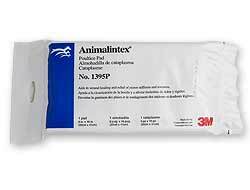 Animalintex is a veterinary poultice dressing. It works effectively as a cold poultice to reduce swelling, stiffness and soreness and as a hot poultice to draw abscesses and infections. Animalintex can also use as an antiseptic dry dressing. It is clean and easy to work with. Each dry disposable pad is pre-dosed with Tragacanth (slippery and cool) and Boric Acid (a mild soothing antibacterial and antifungal). When ready to use, it can be dipped into hot OR cold water and applied to the body. Then, wrapped with Vetrap bandaging tape. Animalintex Hoof Poultice has three pre-cut pads per package. Size is approximately 6". It can be cut to shape. Animalintex Poultice Pad is packaged individually. Size is 8" x 16". It can be cut to shape.